Tri-County Memorials is Eastern Connecticut's full-service monument builder. Featuring top-notch craftsmanship and superior attention to detail, we’ll make sure that your loved one is remembered in the way they deserve. A classic cemetery headstone consisting of a monument and base, the traditional upright is a timeless monument that has been used for centuries. 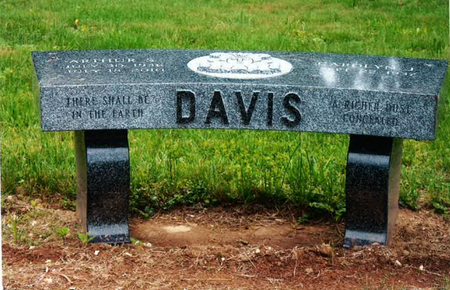 Granite benches are an excellent way to commemorate a loved one, and are made to look equally at home in a cemetery, park, or backyard. Able to be attached to an adjacent memorial or be used as a standalone monument, bronze markers possess unique craftsmanship and dignity. Whether you choose a flush in-ground grave marker, or a slanted marker that protrudes from the surface, you can rest easy knowing that your loved one will be remembered in a dignified manner thanks to our top-notch attention to detail. While saying goodbye to a loved one is no doubt difficult, it's important that they're remembered in the way they would desire. At Tri-County Memorials, we're here to help you every step of the way through the process of selecting a monument, crafting it to your desires, and ensuring that it is presented in the best way possible. Tri-County Memorials is licensed in all New England cemeteries, so your memorial can go anywhere you’d like. From selection and design to crafting your monument, Tri-County Memorials will be there every step of the way. Whether a family gravestone or a cemetery headstone, we’ve got a wide variety of designs and colors. It’s not too early to start preparing for the future. From payment to placement, we can help you plan ahead. Thank you for your top quality work and great suggestions. And most of all, your friendship. My family and I appreciate your help and kindness. I will call you some day when I plan to be in south-eastern CT and collect that bottle of red wine you mentioned! Thank you for all you have done for us. The stone is just beautiful! Dad would've loved it! It was a pleasure working with you knowing that mom mom's lettering is complete brings happiness to both my brother and myself. © 2017, Tri County Memorials. All Rights Reserved.